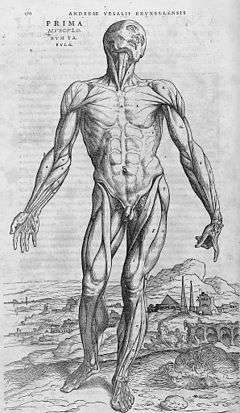 There are three types of muscle tissue in the human body: skeletal, smooth and cardiac. Skeletal striated muscle, or Voluntary muscle, primarily links to bone through tendon, thus enabling through levers of the bones of the human skeleton posturing, upright stance under atmospheric pressure, and voluntary movements. Antagonist muscles oppose a specific movement. This controls a motion, slows it down, and returns a limb to its initial position. Antagonism is not an intrinsic property; it is a role that a muscle plays depending on the motion. 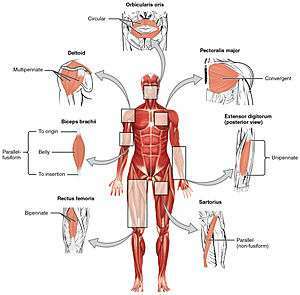 If a motion is reversed, agonist and antagonist muscles switch roles. Because a flexor muscle is always a flexor, in flexion it is the agonist, and in extension it is the antagonist. Conversely, an extensor muscle is the agonist in extension and the antagonist in flexion. 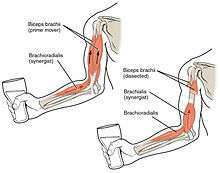 Using the example above of the triceps brachii during a push-up, the elbow flexor muscles are the antagonists during both the up phase and down phase of the movement. 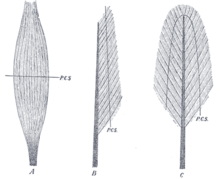 Antagonist and agonist muscles often occur in pairs, called antagonistic pairs. As one muscle contracts, the other relaxes. 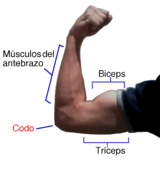 An example of an antagonisic pair is the biceps and triceps; to contract - the triceps relaxes while the biceps contracts to lift the arm. "Reverse motions" need antagonistic pairs located in opposite sides of a joint or bone, including abductor-adductor pairs and flexor-extensor pairs. These consist of an extensor muscle, which "opens" the joint (by increasing the angle between the two bones) and a flexor muscle, which does the opposite by decreasing the angle between two bones. However muscles don't always work this way - sometimes agonists and antagonists contract at the same time to produce force, as per Lombard's paradox. Not all muscles are paired in this way. An example of exception is the deltoid. Smooth muscles are responsible for the contract-ability of hollow organs, such as blood vessels, the gastrointestinal tract, the bladder, or the uterus. It can develop isometric force per cross-sectional area that is equal to that of skeletal muscle. However, the speed of smooth muscle contraction is only a small fraction of that of skeletal muscle. Contraction of smooth muscle is initiated by a Ca2+. Smooth muscle relaxation occurs either as a result of removal of the contractile stimulus or by the direct action of a substance that stimulates inhibition of the contractile mechanism (e.g., atrial natriuretic factor is a vasodilator). ↑ Taber 2001, pp. "Agonist". ↑ Baechle, Thomas (2008). Essentials of Strength Training and Conditioning. USA: National Strength and Conditioning Association. ISBN 978-0-7360-8465-9. ↑ Taber 2001, pp. "Antagonist". ↑ SMOOTH MUSCLE - The university Of Illinois At Chicago Archived November 18, 2015, at the Wayback Machine. ↑ Martini, Frederic; William C. Ober; Claire W. Garrison; Kathleen Welch; Ralph T. Hutchings (2001). 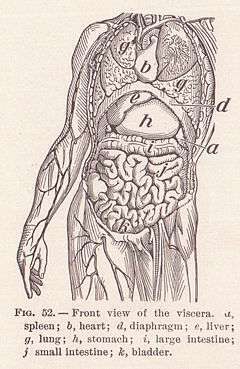 Fundamentals of Anatomy and Physiology, 5th Ed. Prentice Hall. ISBN 0130172928. Willert, editor Donald Venes, Coeditor Clayton L. Thomas, Managing Editor Elizabeth J. Egan, Assistant Editors Nancee A. Morelli and Alison D. Nell. /copy Editor Ann Houska Proofreaders Joy Matkowski and Christopher Muldor. Dictionary Illustrator Beth Anne (2001). Taber's cyclopedic medical dictionary. (Ed. 19, illustrated in full color ed.). Philadelphia: F.A.Davis Co. ISBN 0-8036-0655-9.